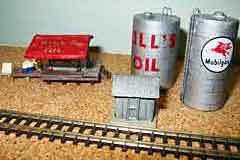 the Update to our World’s Smallest Working Model Railroad Challenge! 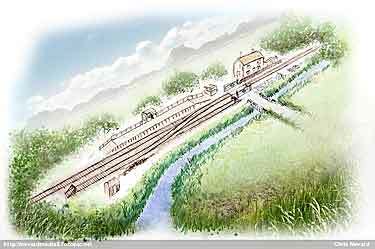 Almost ready for public exhibition in October is a new layout from Chris Nevard, who lives “on the edge of SW London.” Catcott (Catcott Burtle) was a little known station between Edington Burtle and Shapwick on the Highbridge Branch of the Somerset & Dorset Joint Railway. It’s a small station but a very pretty one! The panoramic view above shows off the 7×1½ft (2.1x.4m) scenic section, with its self-lighting and curved backdrop. And there’s a full-train turntable hidden at each end, to turn consists for the return trip! Breathtaking! And it’s still under construction. You’ll be seeing more of this one, I’m sure! OO (1:76) — A HOME FOR YOUR SOPWITH CAMEL, TOO! 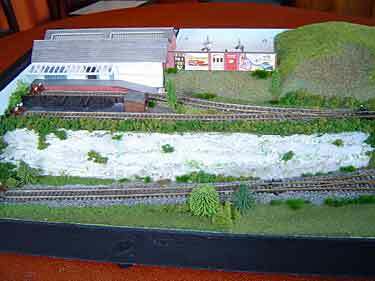 Richard Glover is making great strides forward towards completion of his new layout, Moorside Station, a OO9 delight measuring 95×26.5cm (37×10.4in). Faced with a relatively long period of inactivity due to a medical procedure, Richard immediately drew up a plan based mainly on the track positions at Wantage (but condensed), put together a baseboard from MDF and stripwood, and proceeded to create a railway! “A new feature I wanted to try out was a fiddle yard ‘hidden in plain sight.’ The two sidings at the back on the right fulfil this function. 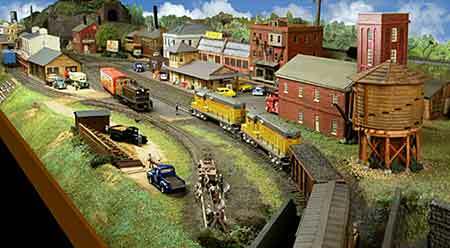 The fiddle yard extends into the scenic area and any wagons standing there can be assumed to be parked in a siding. 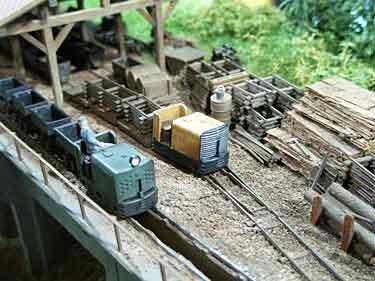 This double use of track is a useful feature in a small layout, where space is always in short supply,” Richard observes. “So that is Moorside, fully operational and with buildings largely complete, but totally deserted! I have plenty of good figures, but painting them is fairly time consuming. Still, it must be done and it will really bring the model to life. 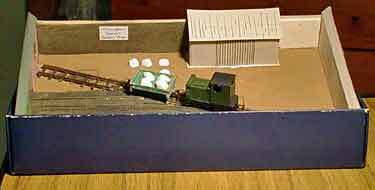 The layout was designed to have no backscene, with the buildings and the walling finishing off the rear edge. But it might be a good idea to use something behind when taking photographs!” Richard Glover is a frequent contributor to these pages and a long-time active member of the Greenwich & District Narrow Gauge Railway Society, in England. 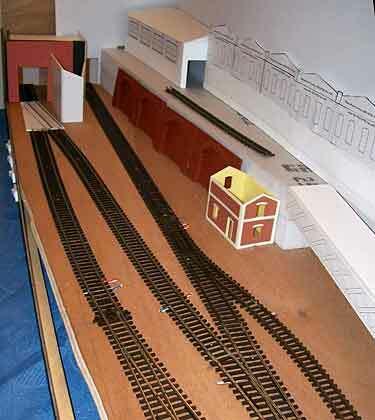 Nick Palette, from Handsacre in Staffordshire, England, sent along some photos of his new HO shelf layout that he calls an “extended Inglenook.” North Point Yard measures 66x12in (168x30cm) and is U.S. modern prototype. Nick brought the layout to this stage in just four weeks of construction! Rob Coppock, from suburban Sydney, Australia, has been fascinated—as so many of us have—with the idea of combining Inglenook and Timesaver switching puzzles into one layout. Adrian Wymann even has a section on this subject in his excellent website on Shunting Puzzles (scroll down the page after you click on the link). Rob actually did something about it! Using templates for Kato HO Unitrack sections, he designed four variations on a common theme, each of which can be operated as both types of switching puzzle, thus adding greatly to the entertainment value of the layouts. Other track systems can be used similarly. All these layouts are less than 72in (183cm) long and vary from 18 to 24in (45 to 60cm) in depth. 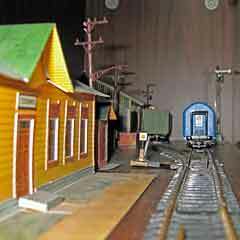 Rob is a pilot with the Police Air Unit and claims that several of his fellow pilots are also avid model railroaders. We’re everywhere! Alexei Kozlov, from Moscow, Russia, is building his bookshelf layout in a real bookshelf! 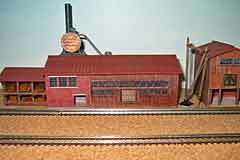 The HO model represents a very small Russian station with a goods warehouse, switchman’s post and house, and station building. Taking advantage of IKEA’s familiar IVAR shelving system, Mark Stutz, from Zurich, Switzerland, has designed a beginner’s HO system that has some advanced features. The basic idea is to put the main scenic layout on the 83x30cm (32x12in) IVAR shelf, with a full-train turntable on the corner unit (56cm/22in square). The basic design is inspired by Herbert Fackeldey in his book, Minimax-Anlagen, and Mark calls the whole series IVARiations. 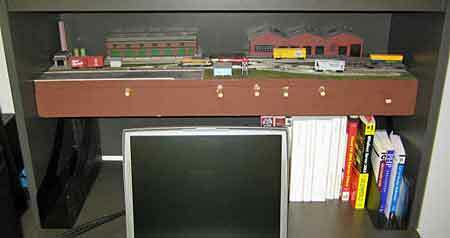 The layout represents a small terminal station, Grebenthal, in Austria or Germany. 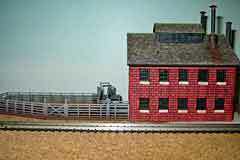 Although designed with Roco HO track, almost any track system could be used. 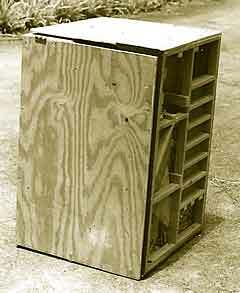 The train turntable can easily be made from an 18in (45cm) kitchen turntable (“Lazy Susan”) as described in an article from this site. One of the pleasures of the IVAR system is that it’s easy to add shelving to an existing unit. The bottom drawing shows how an extension to this little layout can be added using another shelf unit. 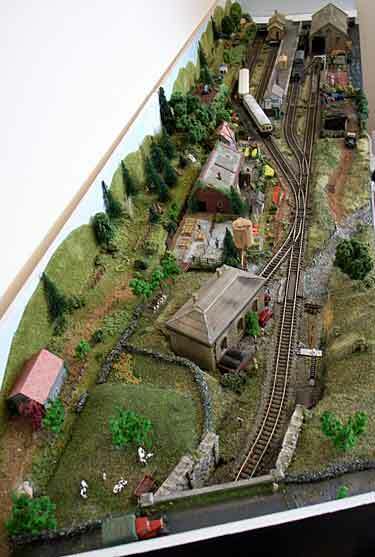 Mark has more information about this layout, and a variety of other small layouts, on his website. 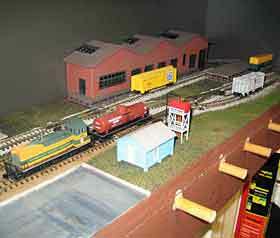 Thirty years ago, Bill Nelson, from Clarksville, Tennessee USA, built a portable HO switching line to take with him to college. It was made in two modules for a total space of 6x2ft (180x60cm) and packed up for transport into a crate measuring 2x2x3ft (60x60x90cm). 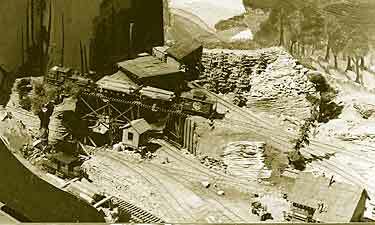 The Bumpass Modules line depicted iron mining in eastern Tennessee in the 1920’s. It boasted an iron furnace, a switchback, a passing siding, an engine house, a siding for loading log cars, a creek and three bridges… plus sharp handlaid switches and tight curves. He’s building the layout on an eye-level shelf unit, lining the rear with industrial flats because, Geoffrey claims, he’s “totally unable to paint anything looking remotely like a realistic backscene.” He has sent the following photos of his early efforts as part of his ongoing therapy. He plans to send updating photos periodically, as a discipline for continuing to work. This site gladly participates in Geoffrey’s ongoing attempts to rehabilitate himself. If he can make it, who knows who else might do it?! Boštjan Jarc, from Novo mesto, Slovenia borrowed a couple ideas from this website to convert a diorama into an operating micro layout. First, he found a prototype for his dual-gauge line in Austria, on the narrow-gauge Zell am See – Krimml line. Then he designed his micro to be very portable: narrow, to fit into exhibition showcases; lightweight for transport; and with a traverser to provide additional train movements. The result is called Tischlerhäusl and is shown in the photos. 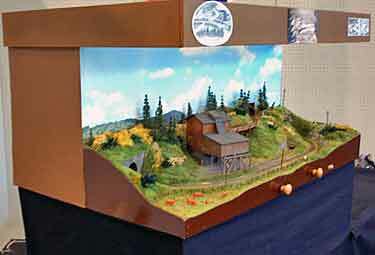 The scenic section measures 34x19cm (13.4×7.5in), with a traverser fiddle yard measuring 32x19cm (12.6×7.5in). The traverser is a simple wooden plate that slides on two cut-down steel drawer slides. 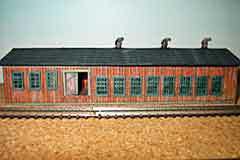 Rolling stock is from an Austrian manufacturer, Ti-H0, and provides trains in both H0 standard (normal) gauge and H0e (HOn30) scale. If you look carefully you can see the difference in the two nearly identical trains (lower right). Controls can be switched to run either the standard-gauge or narrow-gauge equipment… but not both at once. 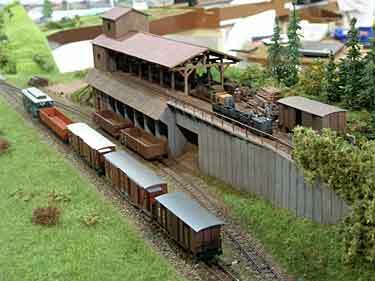 Boštjan also sent a couple photos of a layout project he finished several years ago (below). It’s an H0 module for his club’s layout, but it contains a seperately operated H0e (HOn30) layout. No plan available, but I wanted to show you the little H0e and H0f layout… it’s an irresistible little mine train! 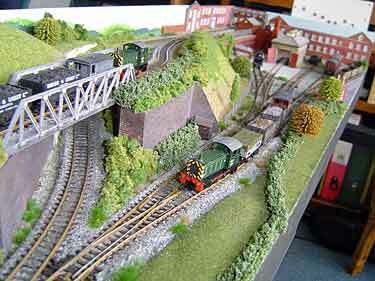 David Mitchell, from Reading, England, has built an N-scale version of the famed Walkley Sidings design. 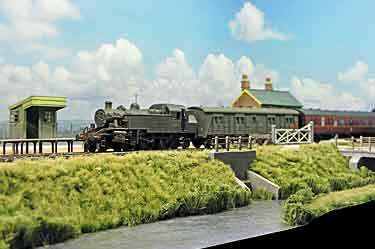 The scenic area is 4x1ft (120x30cm) and the whole layout measures 6x1ft (180x30cm) including fiddle yard. David runs mainly vintage GWR (Great Western Railway) stock, but has a tendency to run whatever interests him at the moment. Great fun is had by all! 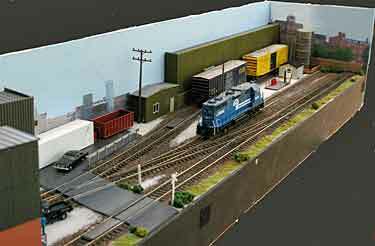 This crisply modeled N-scale Timesaver layout was built by Bob Feldman, from Chicago, Illinois USA. It measures 34.5x9in (88x23cm) and is a friction fit between the walls of this bookcase in Bob’s downtown office. 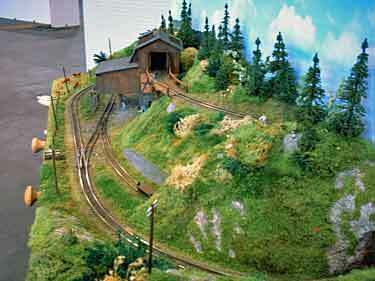 Revd Simon Baker, from Alton, U.K. has constructed his first N-scale railroad as a version of the Gum Stump & Snowshoe layout, called Hartland Industries. The layout occupies a 4x1ft (120x30cm) area, and can pack up into a 2x1x1ft (60x30x30cm) package for transport. Simon points out that he has added a runaround loop at the lower-level terminus, which means that one locomotive can operate the entire layout (unlike the original Gum Stump, which requires two locomotives). But Simon uses two anyway, because it’s more fun. Simon recommends adding extra weight to all wagons to improve uncoupling, which he does manually. For rolling stock he’s tried the new Graham Farish Class 4 shunter and found it to be a good slow runner and excellent for climbing gradients. 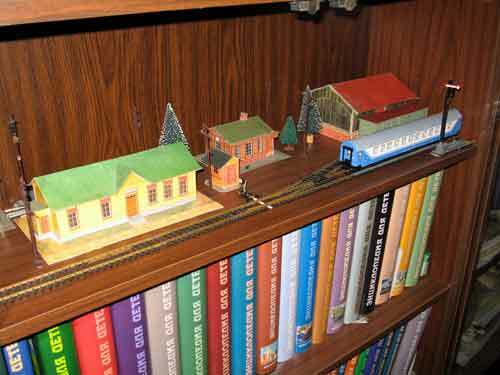 Stretching over 40 feet across one end of Frank’s basement, Raymondale had everything—realistic scenery, grit, railroad action, and above all, a delightful variety of places to switch cars. A total of nine industries received and shipped via the railroad. The photo above shows the West End of Raymondale as it appeared in the late 1940s Delta Lines (the two industries in the immediate foreground are the Sanky Wanky Coffee Co. and Elles Belles bubble-gum factory). 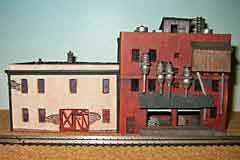 Raymondale is again in the news just now, because the October 2008 issue of Classic Toy Trains magazine featured a reconstruction of the town on the O-scale three-rail layout of Fred Dole. Fred bought the original Ellison structures at auction a few years back, carefully restored them, and used them to rebuild the town much as it originally looked. His version has been straightened and compacted to about 20 feet in length. The photo at right, showing the East End of Raymondale in Fred’s reconstruction, is borrowed from his excellent website. 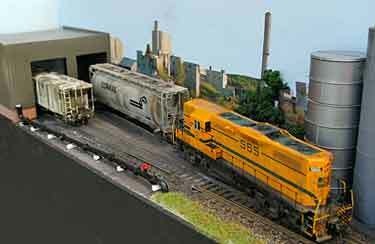 At the other end of the size spectrum, Paul Lipiarski, from Marlton, New Jersey USA, is building a Z-scale version of Raymondale, using Ellison’s published photos, plans, and diagrams as a guide. It’s intended to be a tribute to Frank’s achievement and artistry. For several years Paul’s been constructing the buildings, one by one. He isn’t quite finished… he still has the station, the Elles Belles bubble-gum factory, and (maybe) the brass works foundry to go. I have drawn up a version of the Raymondale track plan using Märklin sectional Z track. The town requires less than six feet of shelf length in this tiny scale! Due to the track geometry, the proportions are slightly different from the original, but all tracks are there and in their correct relationships. Paul’s structures are shown above and below the plan, in roughly the sequence you would encounter them when switching the town from west to east. Remember as you look, these photos are just about life size for Z scale! Paul’s notes are below the illustration, including the one change he’s made, which he believes would meet Frank’s approval. Paul Lipiarski’s Modeling Notes: “My Raymondale will be called Ellison Springs. All buildings are basic card models and most are finished with Prismacolor magic markers (give or take some variations). The building isn’t so hard, it is the preparation of drawings and suitable materials which can be daunting. “JAVA is [my name for Frank’s] Sanky Wanky coffee plant—four letters rather than 10 on the water tower. Chic Sales [woodworking] is now O’Malley Custom Woodworking after my dear departed friend and fellow teacher, Ed O’Malley. The pottery has no name as yet, but it does have a narrow-gauge railroad with scratch built tip cars and flats to bring clay in and take pottery out to the kiln for firing. This is an homage to the guys in the Industrial Narrow Gauge preservation group I belonged to during my too short stay in the Netherlands. “The Grain Mill [Schmaltz Malts] is named Federal Milling since I taught History and remember seeing plants which used names like this. The building next to the grain mill is the El Ropo (Rope-Cigar) works. I have it as the original building of the Grain Mill which expanded to a more modern building next door. The placement of El Ropo and the Feed mill is based on the original I saw as a kid, and it just seemed right. Of course now it’s clear that Frank changed it so he could fit in the foundry. But Frank always said to do what you felt was right for your railroad. 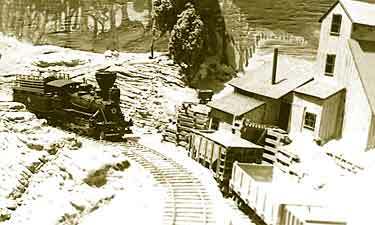 The main point of the WSWMRC is to find and present to the public the smallest and most elegant possible model railroad layout. The Challenge rules insure that it will be a recognizable, working railroad that the general public will understand as an achievement. I will seek to publicize the winner through as many international media channels as I can during the 2008 holiday season in December. The message will be: “This is an extreme example of the fact that everyone has room for a working model railroad, whether it’s this small or somewhat larger. 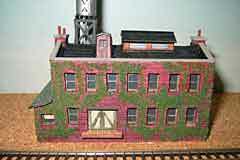 These small layouts are a lot of fun to build and operate!” Selfishly, I’ll add the address of this site, where more information is available. Another benchmark mockup to get your ideas started. 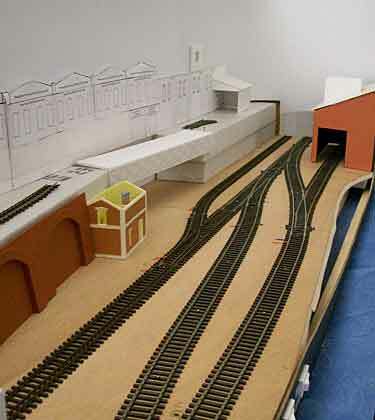 Last time we showed a small circular “pizza” style layout in N scale. In this example, the gauge is the same (9mm) but the scale is larger — HOn30 (1:87). Meet the Binary Hauling Co. Appropriately for this issue’s theme of shelf layouts, this one moves back and forth, rather than round and round. Binary measures 120x57x37mm or 4.72×2.24×1.46in — giving it a volume measurement of 253.08 cu cm, or 15.436 cu in. The ratio of its longest side to the gauge is 120:9 or 13.33:1. The layout, obviously designed as an improbable fragment of a construction site narrow-gauge line, features a traverser holding a loco and one V-skip car plus two short spurs, each holding one V-skip. Yes, that rolling stock is original AHM trains from the 1970s. 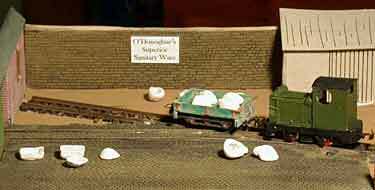 The mission of the layout is to spot an empty V-skip on the track next to the fence (by the “No Tipping” sign), where it’s filled with debris by a dumper (not modeled). 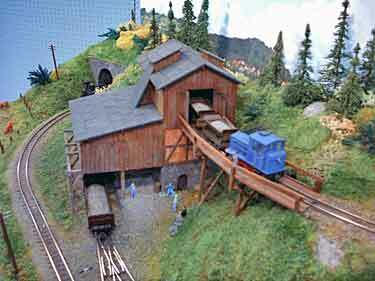 The loco then hauls it, via the traverser, to the other spur, where two husky guys (shown) tip it into a dump truck below (not modeled). Repeat ad infinitum. Mind-numbingly simple, but very compact! Some additional sources of information for you. A number of readers have provided sources of information about very small layouts. From Belgium, Marcus Freistedt sent a link to a comprehensive table of commercial scales smaller than Z, complete with links to the ones that have survived. 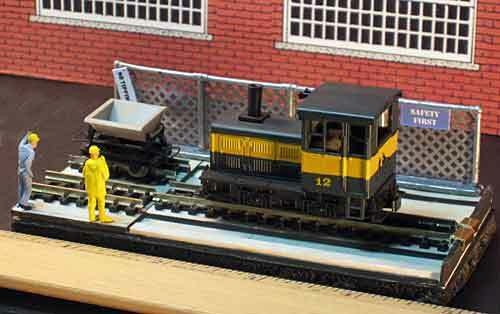 Several readers, including Ryan DeVries from the U.S. and “Mad Marty” Hartley from Australia, pointed out T scale by Eishindo, in Japan… 1:450 scale running on 3mm gauge. Marty and Canadian Dan MacKellar both identified an excellent blog about T scale by David K. Smith. Good reading! I have some reservations about the viability of these tiny trains, but I’d be very interested to see what some of our creative readers can do with them! For full Challenge details and rules, see this page.